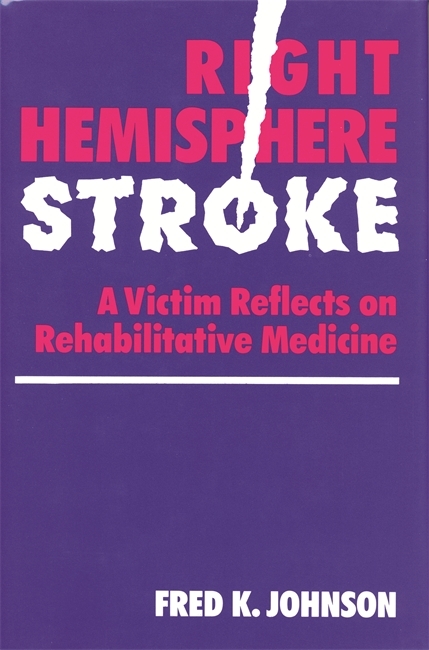 In Right Hemisphere Stroke, Fred Johnson describes in vivid prose the onset of his devastating stroke and the obstacles he overcame during his therapy, giving a patient's view of a first-class rehabilitation institute. Johnson pays particular attention to the personality changes and the problems of disorientation he experienced. He poignantly captures the bewilderment and terror so often felt by stroke patients in the hospital and upon returning home. In telling his story, Johnson provides valuable insights about the effects of stroke and, along the way, calls into question some traditionally held conclusions about the functions of the brain's right hemisphere. The book is important in other ways. As Dr. John Gilroy states in his foreword, Fred Johnson's account moves us to realize that a "stroke affects the brain as a whole, and patients should be treated for brain dysfunction, not hemisphere deficits." Moreover, for Gilroy the book underscores the need for better communication with the patient. With most diseases, health care professionals freely discuss present or anticipated problems with patients and family. In cases of stroke, however, there is a great deal of resistance to sharing the complex problems that arise. Fred Johnson's book is valuable, then, not only as a testament to the courage and determination of one man but also for the lessons it provides for medical students and health care professionals. Fred K. Johnson is currently a staff member and featured columnist for A Stroke of Luck, a newsletter for stroke survivors. Formerly, he was director of labor relations for Keller Industries, a Miami-based manufacturing conglomerate. Johnson holds a B.A. degree from St. Edward’s University and frequently speaks to student and professional groups about strokes and rehabilitative medicine. He has also served on the American Heart Association Stroke Club Awareness Task Force for Texas.